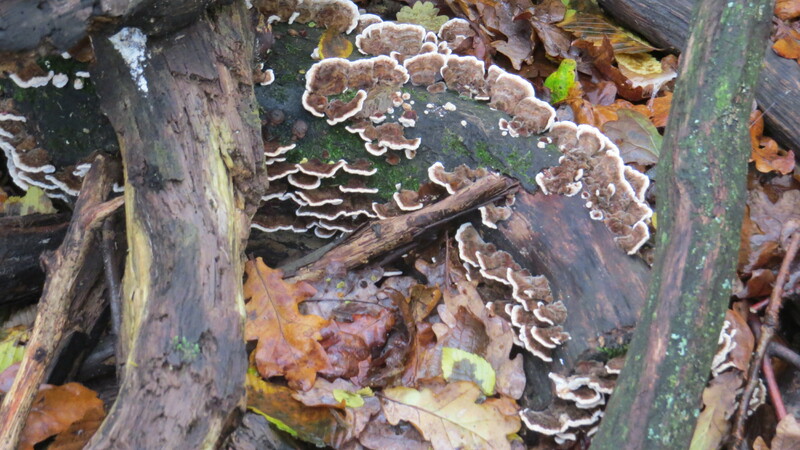 Dear readers, last week I went for a walk in Coldfall Wood. I was not in a good mood, and scuffled through the dead leaves, occasionally using very bad language as I slipped in the mud. However, it didn’t take long before I realised that I was being watched. A rather anxious squirrel was peering at me from behind a log, tail twitching. He catapulted me right out of my self-absorption, as I watched him leaping from branch to branch with his mouth stuffed full of leaves. 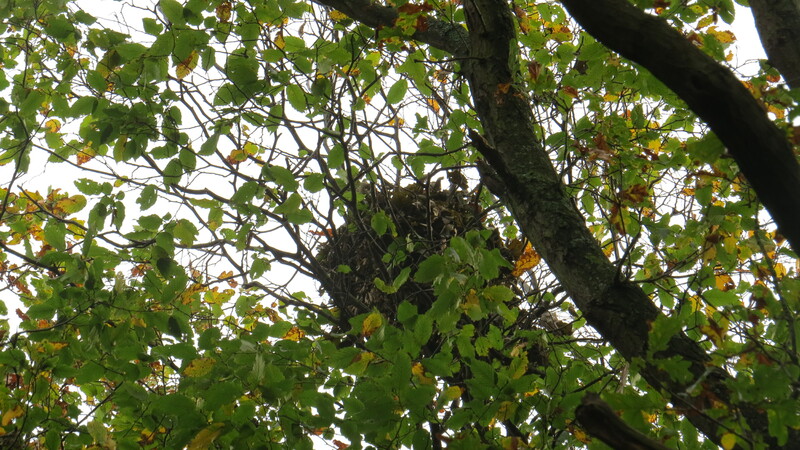 I soon spotted his sleeping quarters, high in an oak tree, and realised that he was preparing for hibernation, and could do without me interrupting him, thank you very much. Well, after this rodentine intervention I felt much better, and actually woke up to what was happening all around me. Which was that Coldfall Wood was positively busting out with fungi. As is usual, once I’d noticed one kind, I found them every where. 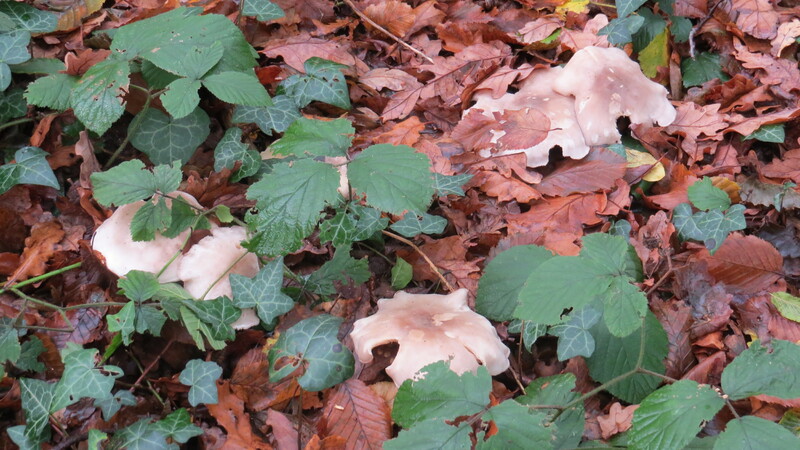 Firstly, I noticed rings of rather non-descript mushrooms emerging from the leaf-litter. Something has been feasting on these mushrooms – every single one has munch-marks around the edges, and I’m sure if I visited the wood at night I would be able to see the mice, rats and squirrels having a fungus feast. There is something deeply mysterious about fungi. The way that they spend so much of their lives under the ground and only burst forth into fruiting bodies in the autumn, when everything else is closing down, fills me a kind of awe. Until this visit to the woods, I have never given fungi a second thought, but now I was overwhelmed by their bounty. I remembered a lecture I’d attended by a mycologist, a man with a pepper-and-salt beard and leather elbow patches on his tweed jacket, who told us that fungi were more closely related to animals than plants, that they were responsible for much of the fertility of the soil and that their lives were irrevocably entwined with those of the plants that we rely upon. And yet, he said, until recently fungi had been so neglected that there was not a category for them on the Red List of endangered species. ‘Fungi are becoming extinct before we even know that they exist’, he said. Of course, this is true of many other species, but these invaluable organisms do seem to suffer from a particular level of human indifference. And yet, we ignore them at our peril. 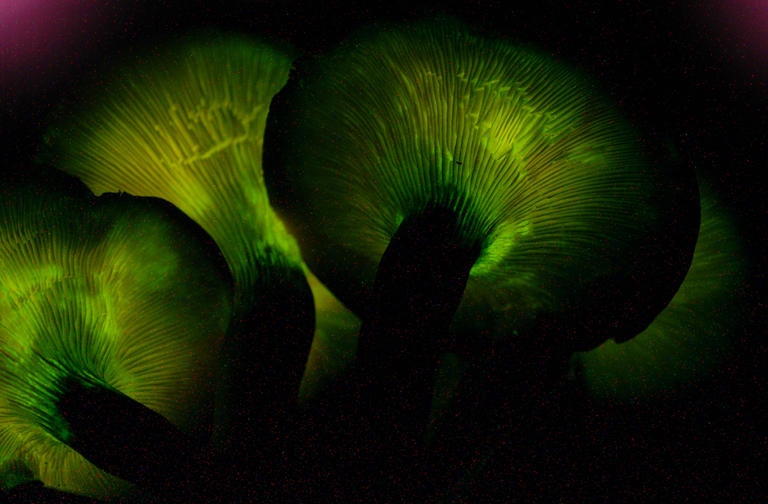 Scientists have shown that fungi have a special relationship with plants, known as mycorrhiza. Fungi colonise the roots of their host plant. The fungi receive carbohydrate from the plant, in the form of sucrose and glucose. The plants receive water and minerals, especially phosphorus. The result is that the plants are much less affected by drought, are more able to take up nutrients even in poor soils, and are less affected by toxicity. We are only just beginning to understand these associations, although they have been known about for over a hundred years. 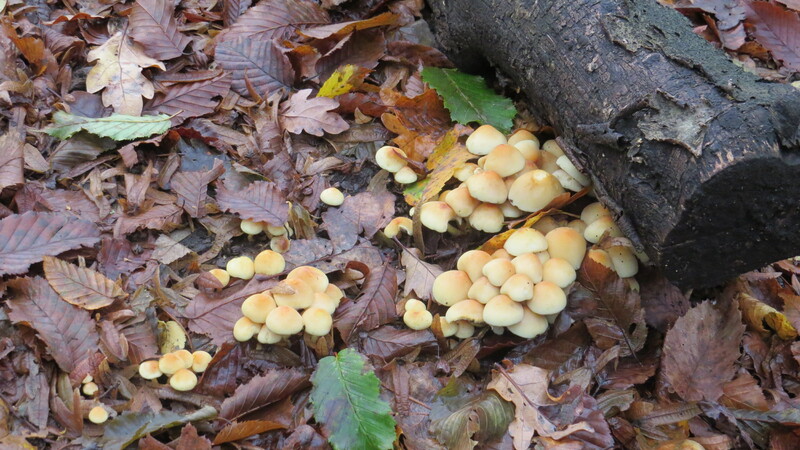 At the base of many of the hornbeams, Sulphur Tuft bubbled forth like so much toffee. 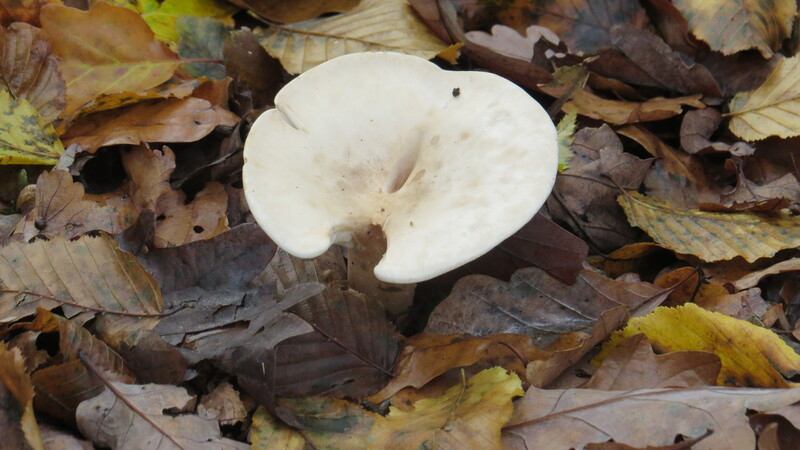 This is one of our commonest British toadstools, and is said to have a ‘hot, acrid’ taste, though as it is also poisonous I decided it was best not to try this out. Not all fungi are big and obvious. Take Candlesnuff Fungus, for example. 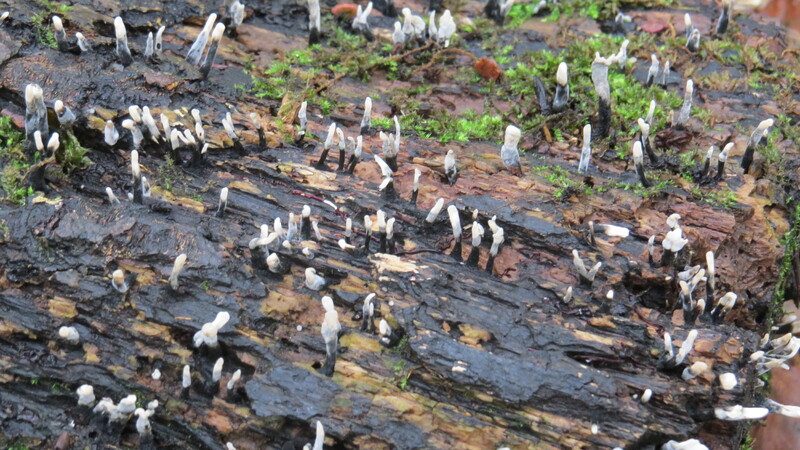 It looks like a little field of white-tipped black candles growing all over this piece of fallen wood. Turkeytail is a kind of bracket fungus, which are amongst the most important agents of wood decay, breaking down the cellulose of dead trees and returning the nutrients to the soil. There has been a lot of coppicing in Coldfall Wood during the past year, and so there are lots of treestumps for the fungi to digest. Furthermore, an ingredient called Polysaccharide-K, which is found in Turkeytail, is said to be potentially useful in the treatment of cancer, though there is no medically approved evidence that the fungus itself is efficacious against the disease. Where the trunks of the coppiced hornbeam trees were stacked up, they were spotted all over with Black Bulgar fungus. 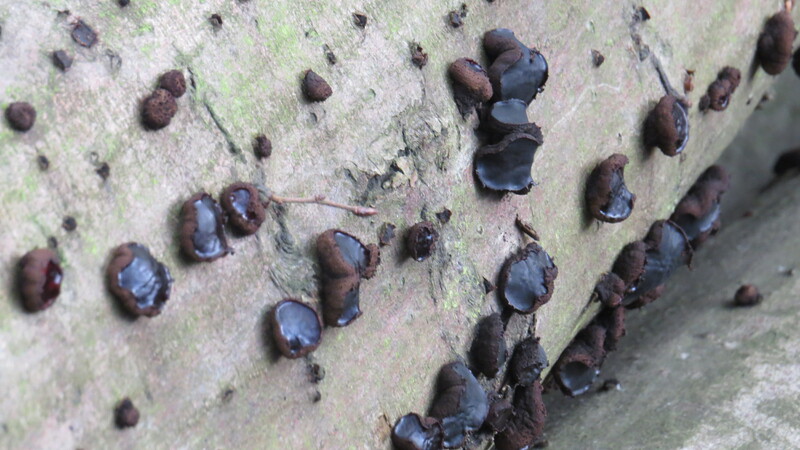 What an interesting fungus this is, with its cup-shaped fruiting bodies of velvety brown and shiny black spores. These spores have been used in the dyeing industry, and I am not surprised – the colour is intense, and I’m sure it would stain very satisfactorily. The tree trunks had only been cut down this year, so it was interesting to me how quickly they had been colonised – practically every single log had a small colony of Black Bulgar swarming over it. As I walked back through the woods, I discovered two more beauties. ‘L.piperatus can be treated to make it edible. This involves thorough salting, followed by marinating. Prolonged frying of chopped up cubes also more or less removes the acrid taste’. Hmm. I don’t think I’ll bother. So, in the space of a few hours, my mood has changed from disgruntlement to mycophilia. I have been bedazzled by the range of forms that fungi take, and gobsmacked at my ignorance of their beauty and variety. This may be my first post on fungi, but I doubt that it will be the last. PS. Identifying fungi to the species level is extremely daunting. They are individually variable, and many species can only be identified by taking a spore print, or by using a microscope. On my walk I was armed only with my camera, so I have tried my best to be accurate, but am very happy to be contradicted if you feel that I’ve got anything wrong. Just add a comment, and I’d be delighted to learn from you. 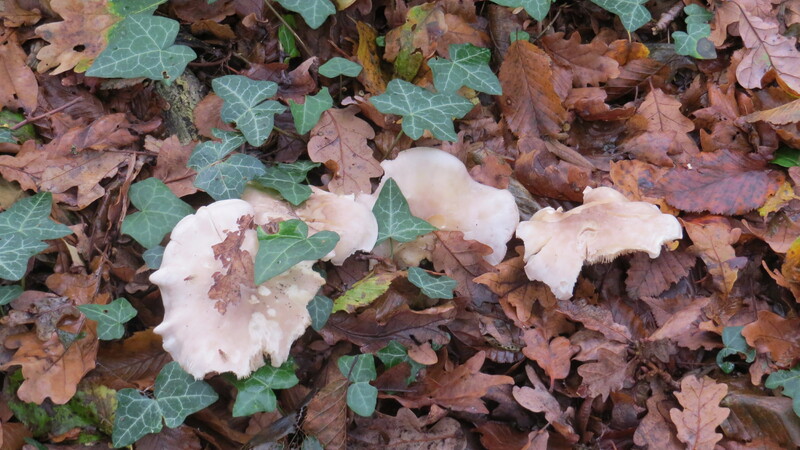 This entry was posted in London Fungi, London Mammals, London Places on November 15, 2014 by Bug Woman. I went on a walk with Dorset Wildlife Trust last Saturday. It was led by John Wright who knows a lot. 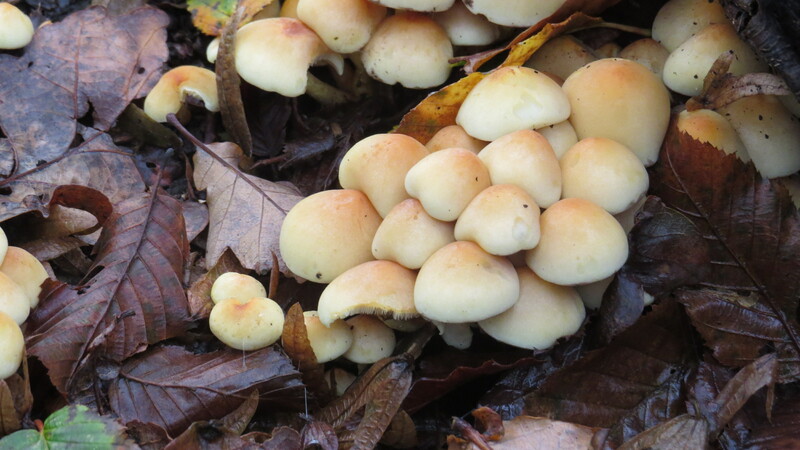 The Sulphur tuft is not edible as are most of the fungi you might come across. But we did find and later eat some Hedgehog mushrooms. It’s a tricky subject. 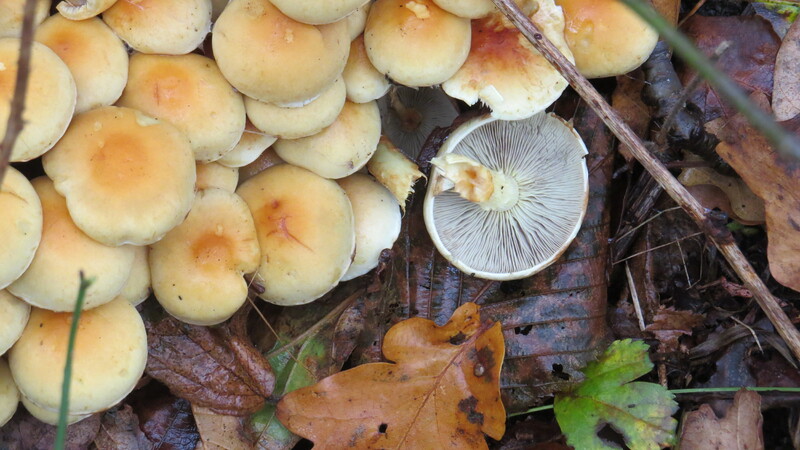 You’re right – I hadn’t realised that there are more species of fungi in the UK than there are species of plants, and with so many of them looking similar, eating them is fraught with hazard for the unwary. 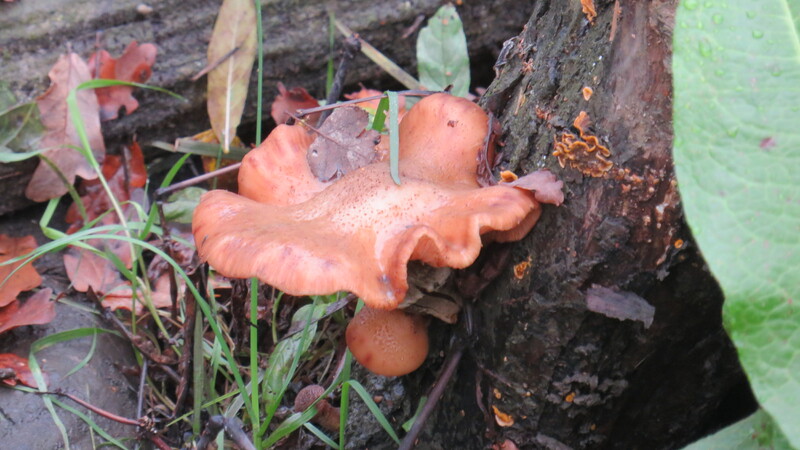 It’s interesting that in other countries, people are much more aware of their local plants and fungi – I remember coming back into Tallinn in Estonia from the woods, and everyone was carrying baskets full of fungi and berries. The very best way to learn, I’m sure, is to find someone who really knows what grows locally, what’s safe and what’s not, just as you did with John Wright. Hi Damian, yes, I remember looking for ‘mushrooms’ too, flat on my tummy in a field after a heavy night. It’s a wonder we’re still alive to tell the tale, as my fungi identification skills weren’t the best even then :-). Wow! I’m going foraging tomorrow. Your post adds to my excitement! I would love to know what you find, Lizard100. 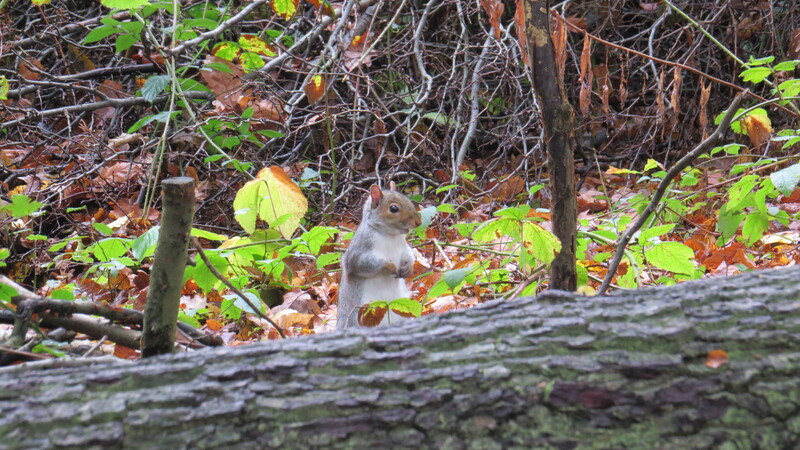 I hope you have a great forage…. Im sure there will be a post soon…. I cant wait either. There is nothing better, in my opinion, than a walk in ancient woodland, across winter rain wetted empty beaches or over blustery mountain tops to ease a troubled or disgruntled mind. It is too long since I’ve trod such trails but your beautiful post gives me inspiration my dear. Hi John, beautifully put! And even a walk around a tiny remnant of ancient woodland in North London can do the trick, as I’m starting to discover. I hope that you get a chance to do some exploring of your own soon. Fascinating article as always. I was reading The Face of London by Harold Clunn published in 1951 and he describes Coldfall Wood as “a densely-wooded open space and beauty spot covering the steep northern slope of Muswell Hill. It is little known except among local residents.” I suspect it is still the same? Lovely photos, how are you John?